Plan for 1-2 full days of an open schedule. This may seem strange, because most people think that pre-planning and itineraries are the most useful tools when preparing for a trip. However, as we all know, things come up that we don’t expect. When this inevitably happens, it can lead to the frustrating dance of attempting to reschedule something that you want to do amongst all the other activities planned. Thus, there can be little time to reschedule activities, tours, meals, etc. if you have a packed itinerary already. Another reason this is helpful is for allowing spontaneity and time for a relaxation day if need be. There is nothing wrong with doing “nothing” on vacation! In fact, creating space and time for no activity is a sure way feel rejuvenated before continuing on with more site seeing! Accept uncertainty of what is to come. This is the ultimate tip! Lean into the discomfort of “not knowing” and experience all the joy that can come of it. While it is a bit tempting to try and predict what can happen on vacation, try and focus on the here and now. Moment by moment is the motto to try here. Practice gratitude on your trip. 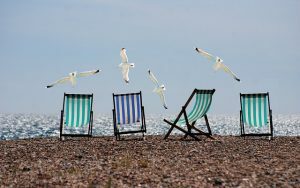 When you work long hours and finally get time to relax and do something you enjoy, it might be hard to resist worrying about what it will feel like to return to work at the end of your vacation. Instead of looking ahead, and experiencing the natural feelings of worry that come with doing so, try to practice gratitude exercises. Think about all that you are grateful for throughout the trip and as your time away from home comes to an end. This can help you direct your mind toward something positive as opposed to stressing about the future. Gratitude quickly redirects your attention and mental energy onto a more sustainable path than worry will every take you down. ← Think You’re Afraid to Fly? You May Not Be.